When we returned home on Monday i went to the Post Office to pick up our held mail. I had an expected package that came earlier than i thought it would. Goodies from my grandma in Germany. I asked my grandma if she would mind picking me up sock yarn whenever she saw a good deal. When i was there i got some that were 1.99 euros or 3.99 euros on sale so i got some good deals-cheaper than here (no offense to any yarn shops or dyers). Anyway she said no problem and next time we spoke she said she already had some for me. First Yarn for Barn raising Quilt, originally uploaded by Craftydiddl. Yummy!!! i love what she picked out and on sale!! So you may be thinking i have some serious sock knitting plans coming but i have other plans for these beauties. Squares!! 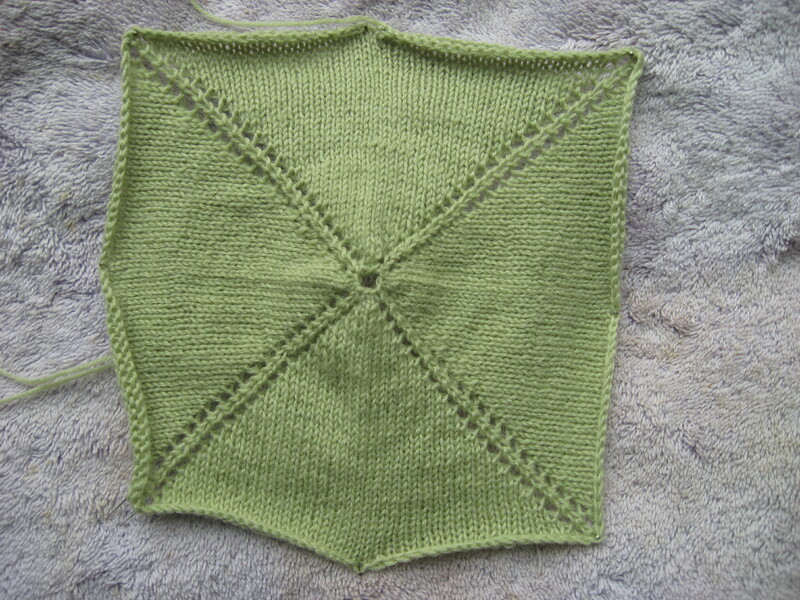 and these squares will then be put together to make this! The six balls shown aren’t going to be enough i have a couple already that i may use and my grandma said she continue to be on lookout for deals. But i will be busy for quite some time with these balls. i also want to work on a swatch this weekend for this. ( scroll down to 3rd row of pics and its the dress in the middle) It looks cute and hopefully i can pull it off but i won’t be making it as long. Your grandmother sent you beautiful yarn! Your knitted quilt will be lovely. What kind of yarn are you thinking of using for the dress? I think it’s very pretty. Pastel purple would be nice. 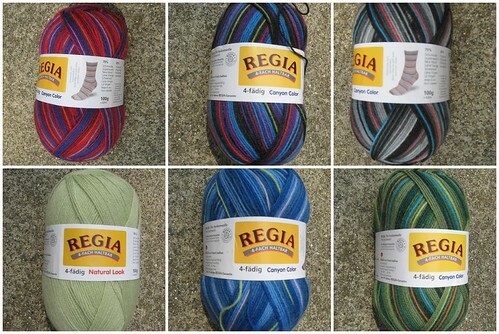 How about I just wound up today two Regia balls for some future socks…but I think I changed my mind just that fast! Haha! The blanket is going to look wonderful when it is completed!